Catalina Rivas of Cochabamba, Bolivia, who now dwells in Mérida, Yucatán, México. She is said to receive Messages from Jesus, Mary, and the angels. She has the approval of her Bishop, René Fernández Apaza, who has given his imprimatur to her Messages. The following text is the reproduction of booklet, “The Holy Mass,” in which Our Lord and Our Lady explain to Catalina what is really going on during the Mass in the spiritual realm, and how we should be more concentrated on the great mysteries that are taking place. In a marvelous catechesis, the Lord and the Virgin Mary have been instructing us first on how to pray the Rosary, that being to pray it with our hearts, and meditate and enjoy the moments when we encounter God and our Blessed Mother. They have also instructed us on the way to make a good confession and, in this document, a teaching on what happens during the Holy Mass and how to live it with our hearts. This is the testimony that I must and want to give to the whole world, for the greater Glory of God and for the salvation of all of those who want to open their hearts to the Lord. It is also given so that many souls consecrated to God will rekindle the fire of their love for Christ, some of whom are the owners of the hands that have the power to bring Him to our world so that He can become our nourishment. It is also given for others so that they break lose of the “routine practice” of receiving Him, and relive the amazement of their daily encounter with Love. 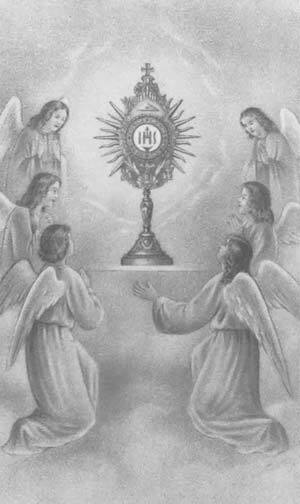 And it is given so that my lay brothers and sisters from the entire world live the greatest Miracle with their hearts: the celebration of the Eucharist. It was the vigil of the Annunciation, and the members of our group had gone to the Sacrament of Reconciliation. Some of the ladies of the prayer group had not been able to do it, and so they left their reconciliation for the next day before the Mass. “Today is a day of learning for you, and I want you to pay close attention because of what you will witness today. Everything that you will experience today, you will have to share with all of humanity.” I was deeply moved without understanding why, but I tried to be very attentive. The first thing I noticed was a choir of very beautiful voices that was singing as if it was far away. For moments the music came closer and, then, it went further away like the sound of the wind. She answered: “Do you think that since last night you have not offended the Lord? Let Me remind you of a few things. When you left to come here, the girl who helps you approached to ask you for something and, as you were late and in a hurry, you did not answer her in a very nice way. There was a lack of charity on your part, and you say, you have not offended God…? “While on the way here, a bus crossed over your lane and almost hit you. You expressed yourself in a very non-advisable way against that poor man, instead of saying your prayers and preparing yourself for Mass. You have failed in charity and lost your peace and patience. And you say you have not hurt the Lord? This was enough. I felt so bad that I had more than enough to ask for forgiveness from God. It was not only for the offenses of that day, but also for all the times that, like so many other people, I had waited for the priest to finish his homily before entering the Church. It was also for the times that I did not know or refused to understand what it meant to be there, and for the times that perhaps my soul was full of more serious sins, and I had dared to participate in the Holy Mass. Our Lady said: “I want you to be attentive to the readings and to all of the homily of the priest. Remember that the Bible says that the Word of God does not return without bearing fruit. If you are attentive, something from all that you heard will remain in you. You should try to recall, all day long, those Words that left an impression on you. Sometimes it may be two verses, other times the reading of the entire Gospel, or perhaps only one word. Savor them for the rest of the day, and it will then become part of you, because that is the way to change one’s life, by allowing the Word of God to transform you. Once again I thanked God for giving me the opportunity to hear His Word. And I asked Him for forgiveness for having had such a hard heart for so many years, and for having taught my children that they had to go to Mass on Sundays because it is commanded by the Church, and not for love and the need to be filled with God. 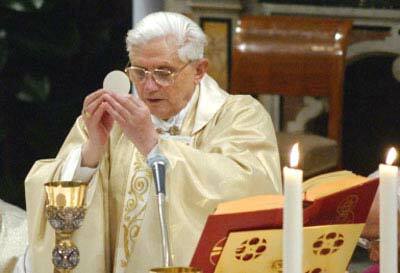 I had attended so many Eucharistic Celebrations mostly out of obligation and, because of this, I believed I was saved. But I did not live it and, much less, did I pay attention to the readings or to the priest’s homily! How much pain I felt for so many years of needless loss because of my ignorance! How superficial is our attendance at the Mass when we go only because someone is getting married, or for a funeral Mass, or because we have to be seen by society! How much ignorance about our Church and the Sacraments! How much waste in trying to instruct and enlighten ourselves about the things of the world, which in a moment can disappear, leaving us with nothing and, at the end of our life, not serve to extend a minute to our existence! However, we know nothing of that which will give us a little of heaven on earth and, afterwards, eternal life. And we call ourselves cultured men and women! Before the Altar, there appeared some shadows of people in a gray color with their hands raised. 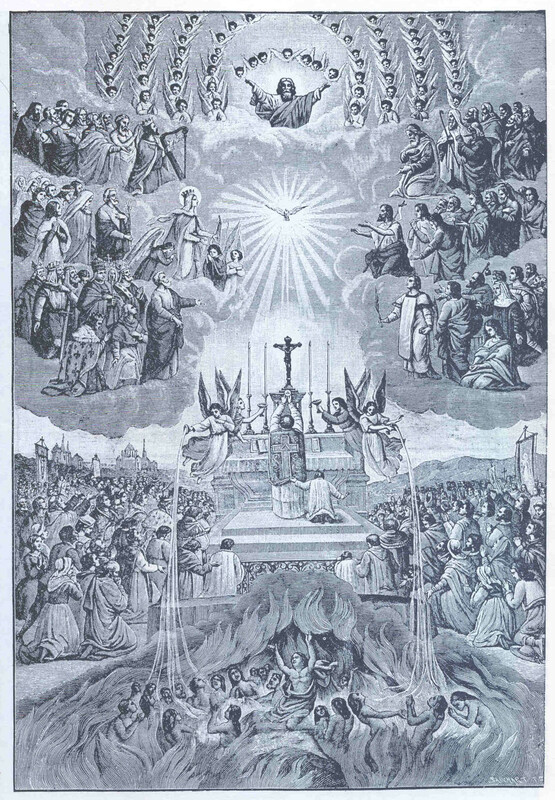 The Holy Virgin said: “These are the blessed souls of Purgatory, who await your prayers to be refreshed. Do not stop praying for them. They pray for you, but they cannot pray for themselves. It is you who have to pray for them, in order to help them depart so that they can be with God and enjoy Him eternally. To see that beautiful countenance of the Mother at that moment of the words “Holy, Holy, Holy…” as well as all the others with their radiant faces, with hands joined, awaiting that miracle which repeats itself continuously, was to be in Heaven itself. And to think there are people who can, at that moment, be distracted in conversation. It hurts me to tell you, many men, more than women, stand with their arms crossed, as if paying homage to the Lord as one equal to another. The celebrant said the words of the Consecration. He was a person of normal height, but suddenly, he began to grow, becoming filled with light, a supernatural light between white and gold that enveloped him and grew very strong around the face. And because of it, I could not see his features. When he raised the Host, I saw his hands, and on the back of his hands, he had some marks from which emanated a great deal of light. It was Jesus! It was Him Who was wrapping His Body around the celebrant, as if He were lovingly surrounding the hands of the Archbishop. At that moment, the Host began to grow and became enormous, and upon it the marvelous face of Jesus appeared looking at His people. I told it to Him, and it seemed as if I was the only one He was looking at from the enormous Host. But I learned that this was the way He gazed at each person, with love to the fullest. Then I lowered my head until I had my forehead on the floor, as did all the Angels and the Blessed from Heaven. Perhaps for a fraction of a second, I wondered how Jesus was taking on the body of the celebrant and, at the same time, He was inside the Host. And as he lowered the Host, it returned to its normal size. Tears ran down my cheeks; I was unable to let go of my astonishment. Immediately, the Archbishop said the words of the Consecration of the wine and, as the words were being said, lightning appeared from the heavens and in the background. The walls and ceiling of the church had disappeared. All was dark, but for that brilliant light from the Altar. Suddenly, suspended in the air, I saw Jesus crucified. I saw Him from the head to the lower part of the chest. The cross beam of the Cross was sustained by some large, strong hands. From within this resplendent light, a small light, like a very brilliant, very small dove, came forth and flew swiftly all over the Church. It came to rest on the left shoulder of the Archbishop, who continued to appear as Jesus because I could distinguish His long hair, His luminous wounds, and His large body, but I could not see His Face. Above was Jesus crucified, His head fallen upon His right shoulder. I was able to contemplate His face, beaten arms and torn flesh. On the right side of His chest, He had an injury, and blood was gushing out toward the left side, and toward the right side, what looked like water, but it was very brilliant. They were more like jets of light coming forth towards the faithful, and moving to the right and to the left. I was amazed at the amount of blood that was flowing out toward the Chalice. I thought it would overflow and stain the whole Altar, but not a single drop was spilled. From that day on, I do not care if the world thinks I am crazy, but I ask everybody to kneel and try to live, with their heart and with all their sensibility that they are capable of, this privilege that the Lord grants us. When we were going to pray the Our Father, the Lord spoke for the first time during the celebration, and said: “Wait, I want you to pray with the deepest profundity which you can summon. At this moment, bring to mind that person or persons which have done you the greatest harm during your life, so that you embrace them close to your bosom, and tell them with all your heart: `In the Name of Jesus, I forgive you and wish you peace. In the Name of Jesus, I ask for your forgiveness and wish my peace.’ If the person is worthy of that peace, then the person will receive it, and feel better for it. If that person is not capable of opening up to that peace, then peace will return to your heart. But I do not want you to receive nor offer peace when you are not capable of forgiving and feeling that peace in your heart first. I do not know how to explain my pain, at the realization of how much we can hurt the Lord. And also how much we can injure ourselves by holding so many grudges, bad feelings and unflattering things that are born from our own prejudices and over-sensitivities. I forgave; I forgave from the heart, and asked for forgiveness from all the people whom I had hurt at one time or another, in order to feel the peace of the Lord. Suddenly, I saw that among some (not all) of the people who were embracing each other, a very intense light placed itself between them. I knew it was Jesus, and I practically threw myself to embrace the person next to me. I could truly feel the embrace of the Lord in that light. It was Him Who embraced me giving me His peace, because in that moment, I had been able to forgive and remove from my heart all grief against other people. That is what Jesus wants, to share that moment of joy, hugging us and wishing us His peace. Dear brothers and sisters, that is the moment in which we should pray for them, because they are the Church as we, the laity, are also. Many times we, the laity, demand so much from the priests, but we are unable to pray for them, to understand that they are human, and to comprehend and appreciate the solitude that many times can surround a priest. We should understand that the priests are people like ourselves and that they need to be understood, to be cared for. They need affection and attention from us because they are giving their life to each one of us, as Jesus did, by being consecrated to Him. The Lord wants the people of the flock that God has entrusted to the priest to pray and help in his sanctification. Someday, when we are on the other side, we will understand the marvels that the Lord has done, giving us priests who help us to save our souls. The people began to leave their pews on their way to Communion. The great moment of the encounter had arrived. The Lord said to me: “Wait a moment; I want you to observe something…” An interior impulse made me raise my eyes towards the person who was going to receive Communion on the tongue from the hands of the priest. “This is how I Myself rejoice in embracing a soul who comes with a clean heart to receive Me.”The tone of voice of Jesus was that of a happy person. I was astonished to see my friend return to her pew surrounded by light, embraced by the Lord. I thought of the marvel that we miss so many times by going to receive Jesus with our small or large offences, when it should be a feast. Many times we say that there are no priests to whom to go to confess at any given moment. But the problem is not about confessing at each moment, but the problem resides in our ease of falling into evil again. On the other hand, in the same way that we make an effort to search for a beauty parlor, or men search for a barber when we have a party, we have to also make an effort to seek a priest when we need to remove all that dirt from ourselves. We must not have the audacity to receive Jesus at any moment with our hearts full of ugly things. I received that Host which had a different flavor. It was a mixture of blood and incense that inundated me entirely. I felt so much love that the tears ran down my cheeks without me being able to stop them. When I returned to my seat, while kneeling down, the Lord said:“Listen…” A moment later, I began to hear the prayers of the lady who was seated in front of me and who had just received communion. Do you all realize that He, Love, is begging for our love, and we do not give it to Him? Moreover, we avoid going to that encounter with the Love of Loves, with the only love who gives of itself in a permanent oblation. How much we miss in not understanding and not participating every day at the Holy Mass! Why not make an effort to begin the day a half hour earlier and run to the Holy Mass and receive all the blessings that the Lord wants to pour over us? I am aware that, because of their obligations, not everybody can attend daily Mass, but at least two or three times a week. So many avoid Mass on Sundays with the smallest excuse, that they have a child, or two, or ten, and, therefore, they cannot attend Mass. How do people manage when they have other important types of commitments? They take all the children, or take turns and the husband goes at one hour and the wife another, but they carry out their duty to God. We have time to study, to work, to entertain, to rest, but WE DO NOT HAVE TIME, AT LEAST ON SUNDAY, TO GO TO THE HOLY MASS. “Men plan their day, their week, their semester, their vacations, etc. They know what day they are going to rest, what day they will go to the movies or to a party, or visit grandmother or the grandchildren, the children, their friends, and to their amusements. How many families say at least once a month: `This is the day for our turn to go and visit Jesus in the Tabernacle,’ and the whole family comes to talk to M<%18>e<%0>? How many sit down in front of Me and have a conversation with Me, telling Me how it has been since the last time, telling Me their problems, the difficulties they have, asking Me about what they need, making Me part of these things? How many times? “I wanted to save My creature, because the moment of opening the door to Heaven has been impregnated with too much pain…” “Remember that not even one mother has fed her child with her own flesh. I have gone to that extreme of Love to communicate My merits to all of you. Then the Lord spoke to me about the fruits that must come from each Communion that we take. It does happen that there are people who receive the Lord daily but do not change their lives. They spend many hours in prayer and do many works, etc., but their life does not go on transforming, and a life that does not transform cannot bear true fruits for the Lord. The merits we receive in the Eucharist should bear the fruits of conversion in us and fruits of charity toward our brothers and sisters. We the laity have a very important role in our Church. We do not have the right to be silent, because the Lord has sent us out, as all the baptized, to go forth and announce the Good News. We do not have the right to absorb all this knowledge and not share it with others, and to allow our brothers to die of hunger when we have so much bread in our hands. We cannot watch our Church crumble as we stay comfortable in our parishes and homes, receiving and receiving so much from the Lord: His Word, the homilies of the priests, the pilgrimages, the Mercy of God in the Sacrament of Reconciliation, the marvelous union with the nourishment of Communion, the talks of preachers. In other words, we are receiving so much and we do not have the courage to leave our comfort zone and go to a jail, to a correctional institution, to speak to the neediest. To go and tell them not to give up, that they were born Catholic and that their Church needs them there, suffering, because their suffering will serve to redeem others, because that sacrifice will gain for them eternal life. We are not capable of going where the terminally ill are in the hospitals, and by praying the Divine Mercy Chaplet, helping them with our prayers during that time of struggle between good and evil to free them from the snares and temptations of the devil. Every dying person has fear, and just taking their hand and talking to them about the love of God and the marvel that awaits them in Heaven next to Jesus and Mary, next to their departed ones, gives them comfort. The hour in which we currently live does not allow us to be indifferent. We must be an extension of the hands of our priests and go where they cannot reach. But for this, we need courage. We must receive Jesus, live with Jesus, nourish ourselves with Jesus. We are afraid to commit ourselves a little more, and when the Lord says, “First seek the Kingdom of God, and the rest will be added onto you,” He says it all, brothers and sisters. It means to seek the Kingdom of God, by all possible means and with all means, and to open your hands in order to receive EVERYTHING in addition! This is because He is the Master Who pays the best, the only One Who is attentive to your smallest needs. Brothers, sisters, thank you for allowing me to carry out the mission that was entrusted to me, that of having these pages reach you. The next time you attend Holy Mass, live it. I know the Lord will fulfill for you His promise that “your Mass will never again be the same.” And when you receive Him, love Him! Experience the sweetness of feeling yourself resting against the folds of His side, pierced for you in order to leave you His Church and His Mother, to open for you the doors to His Father’s House. Experience this so that you are able to feel for yourself His Merciful Love by means of this testimony, and try to reciprocate with your childlike love. Copyright © 2004 by The Great Crusade of Love and Mercy. All rights reserved. 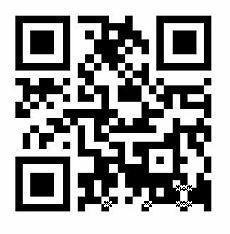 This booklet is published in coordination with The Apostolate of the New Evangelization. Translated from the April 2003 Revision of the original Spanish edition, published in Merida, Mexico. Permission is granted to reproduce this booklet in its entirety with no changes or additions and as long as the reproduction and distribution is done solely on a not-for-profit basis. For information on ordering printed copies of this booklet and other books and videos, please write to: The Great Crusade of Love and Mercy, Inc., P.O. Box 857, Lithonia, Georgia 30058 USA, or visit the ministry’s Internet Site at: http://www.loveandmercy.org.